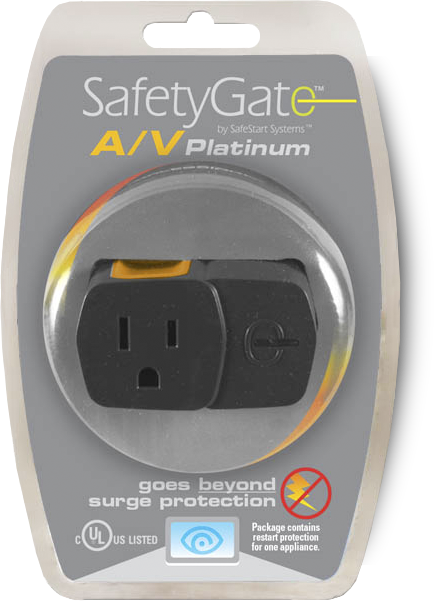 The SafetyGate™ AV Platinum retrofit is state-of-the-art low cost restart protection solution for use with sensitive electronic equipment to prevent equipment damaging restarts, surges and low voltage operation after a power supplier blackout / brownout, a breaker trip, or accidental unplugging at the wall outlet. When power is cut and then restored it can require a full minute or longer depending on your location to restore to full capacity flow. During that time your electronic equipment’s power supply is subject to varying under and over voltage swings. Much like running a water pump dry your equipment power supplies struggle to compensate and prevent improper voltage swings from damaging your equipment. This process at best dramatically reduces the life of your equipment’s power supply and related components, and at worst will cause severe and often irreparable damage to your equipment. Surge protection devices alone do nothing to prevent under voltages or multiple on-off cycling, which are the most likely results in a power loss/restoration and in fact cause the most damage to equipment. One SafetyGate A/V Platinum retrofit attached to your power strip can protect all of your sensitive Computer and A/V equipment….and because the patented SafetyGate restart protection circuitry resides in the power plug, your equipment is not only protected against power outages and breaker trips but also from an accidental un-plugging from the wall or power outlet. The SafetyGate A/V Platinum uses the same patented technology as in our products used by Military, Aerospace and Major Medical facilities around the world. It works by recognizing when your equipment is connected during a power loss and upon power restoration immediately puts up a protective “gate” stopping the flow of electricity and preventing an unauthorized equipment damaging restart. To resume power to your equipment simply reset your SafetyGate A/V Platinum by cycling your power strip On-Off button. SafetyGate products eliminate the hazards and property damage caused by unauthorized restarts by allowing the user to control the power restoration timeline.